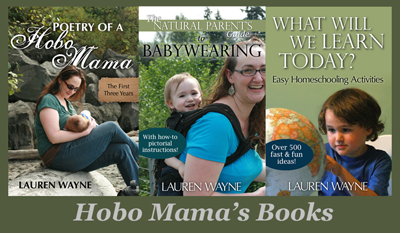 Hobo Mama: Why do we push our babies out of the nest? This quote and the book as a whole have really put things into perspective for me as to why I would even frame the situation that way. The Western model of parenting and childhood is that children are a burden on resources of money, time, and energy, and that children don't contribute anything useful to the family. They become contributors to society only when they leave home and are under no familial obligation to give back to the parents who raised them or to care for them as they age, as is expected in certain other cultures. This is simply how things are in my culture, and it's neither good nor bad on the outside. But it certainly made me wonder why I would want to make such a sacrifice -- what was in it for me? The kids don't appreciate you when they're young, and they don't agree with you when they're older, so what do parents get out of this arrangement? It's not as if the world population is in danger of declining anytime soon, so I didn't have a biological imperative to procreate. My religion doesn't now require that I bear children simply because I can, though that has been a dictate in the past. I didn't really have that supposedly inborn desire to pass on my genes, because I know they're not that great. But reproduce I did, and the questions still remain. This book has helped me crystallize the thoughts misting through my brain. America in particular, but this applies to other Western cultures as well, has a cult of independence. Everyone has to be self-sufficient to succeed in what we see as a cutthroat, competitive market. We start this drive toward independence with our tiniest babies, by feeding them on our terms, by placing them in hard plastic shells instead of human arms, by putting them to sleep in a dark and lonely separate room. And, oh, it works. The result? I'll say it again: Children who won't appreciate you and will grow up to be willful 20- or 30-somethings who resent you, move across the country, and purposely do everything the opposite of what you've chosen for your life. Why are we so married to the ideal of independence? Even when arguing for cosleeping, on-cue breastfeeding, and other attachment parenting philosophies, we justify them by assuring the naysayers not to worry, that the children will be even more independent as a result of these early attachments. Well, self-confident, I hope, and self-reliant to a healthy point. But I've come to believe that having my child dependent on me for love, support and guidance might not be such a bad thing after all. It might make having him worth it in the end.